Ryu Hyun-jin threw seven shutout innings for the Los Angeles Dodgers, but did not receive a decision in the Dodgers’ 3-2 victory over the San Francisco Giants on Sunday night. 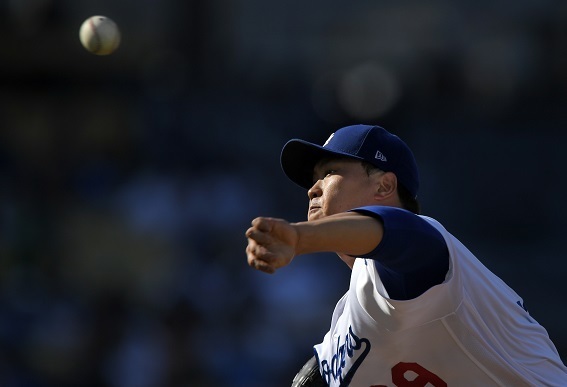 Ryu was masterful, scattering five hits and a walk over his seven innings pitched, also striking out seven. He did not allow a baserunner to reach second base until the seventh inning, aided greatly by his defense, which turned four double plays behind him. 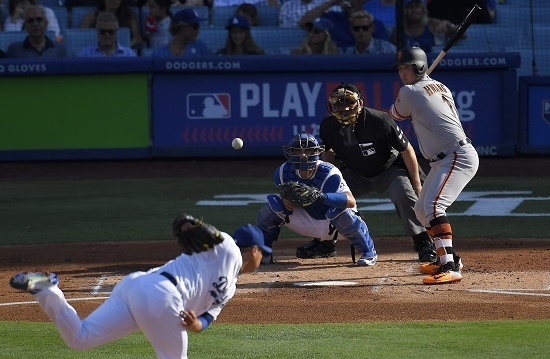 The Giants threatened in Ryu’s final inning, opening with back-to-back singles, but Ryu induced two fly outs and Dodgers center fielder Enrique Hernandez threw out Joe Panik at home to preserve the shutout. The Dodgers turned six double plays in total, tying a franchise record. Ryu dropped his earned run average to 3.83, the first time it had been below 4.00 since April 7. He threw just 85 pitches, but was lifted for pinch hitter Yasmani Grandal in the bottom of the seventh. Ryu’s stellar outing was matched by Giants ace Madison Bumgarner, in his fourth start back from the disabled list. Bumgarner matched Ryu’s line identically, also allowing five hits and a walk over seven innings pitched, with seven strikeouts. Giants third baseman Hwang Jae-gyun went 0-for-2 against Ryu with a strikeout. Hwang had last faced Ryu in the Korea Baseball Organization in 2012, and was 13-for-45 (.289) in his career against Ryu in the KBO. Hwang was lifted for pinch hitter Conor Gillaspie in the eighth inning, and Gillaspie hit a solo home run off Ryu’s replacement, Josh Fields, to give the Giants a 1-0 lead. However, the Dodgers tied it up in the ninth when Chase Utley hit an infield single, stole second and scored on Yasiel Puig’s single to center. The 1-1 tie would remain until the 11th, when Kelby Tomlinson walked, stole second, moved to third on a Denard Span groundout and scored on a single by Joe Panik. But in the bottom half of the eleventh, Corey Seager doubled with one out and Justin Turner was intentionally walked, bringing rookie Kyle Farmer to the plate as a pinch hitter in his first major league at-bat. Farmer took two quick strikes from Giants reliever Albert Suarez, but worked the count to 3-2 before lashing a line drive into the right field corner. Seager scored easily, and the relay throw from first baseman Brandon Belt was off-line, and Turner scored to give the Dodgers a 3-2 walk-off victory. The win was the Dodgers’ ninth walk-off victory of the year, tying the Oakland Athletics for most in the MLB. With the win, the Dodgers also completed a sweep of the Giants for their MLB-leading 74th victory. The Dodgers have a travel day Monday before beginning an East Coast road trip Tuesday, with three games in Atlanta against the Braves and three games in New York against the Mets. The Giants start a four-game set against the Oakland Athletics on Monday, with the first two in Oakland and the second two in San Francisco.